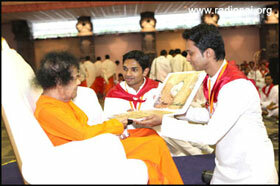 The third successful “Prema Bandham” concluded on February 5 in Prashanti Nilayam. For those who have come in late, the various batches of students have been congregating at the Lotus feet along with their families and this fest of love has been christened, “Prema Bandham” - meaning the ‘Bond of Love”. The batch that had completed its post graduation in 2006 had been blessed with the opportunity in the first week of February. 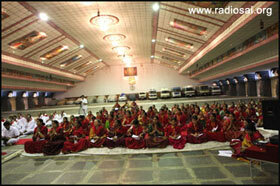 By 5:00 p.m. all the alumni along with their families were seated in the Poornachandra auditorium. A stage had been set up and a backdrop with the caption, “Prema Bandham” in Telugu had been put up. 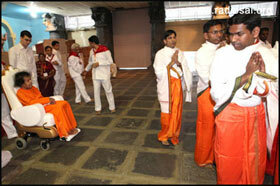 The clock just struck 6 when Swami arrived out of the Yajur Mandir. There were two representatives from the 2006 batch who invited Him to Poornachandra auditorium and Swami graciously consented. Swami moved into the auditorium from the rear entrance. 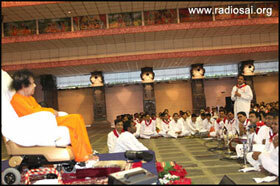 As He arrived on the stage, a group of students began to chant Vedas. 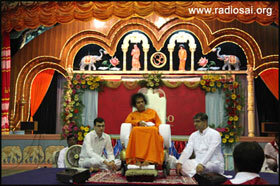 Swami moved down the stage and up the temporary stage that had been set up. A couple of the alumni moved to Swami and sought permission to begin the programme. 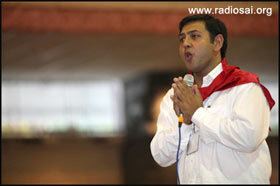 They began with a couple of talks reminiscing the Primary school days and a Telugu song, “Madhura mohana”. There is some magic about this song. Swami always becomes so moved and emotional as He hears it being rendered - irrespective of the occasion, location, singers, music, etc. In fact, during His Delhi trip in April 2010, Swami had asked His boys the details of the song - who composed it, what are the lyrics and the meaning, etc. And even that day, Swami was so moved and happy as the song was rendered. After that song, there were more speeches and songs in English and Hindi. The talks were in Tamil also. For each of the songs, there were a couple of boys who went to Swami with the lyrics sheet and after about five songs, Swami said that it was getting late and the devotees were all in bhajans. He agreed to the request of going around, along the lines, blessing everyone assembled. 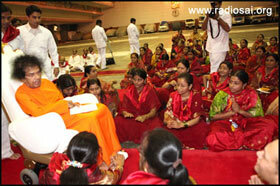 The gents and ladies were seated separately and Swami moved amidst them lovingly. As He completed the rounds, He asked for aarthi. 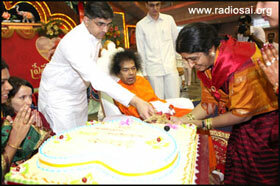 After this, Swami moved out to the car and went into the Sai Kulwant Hall. 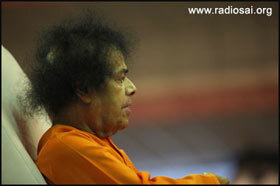 It was 6:50 p.m. Swami took a complete round in Sai Kulwant Hall and sat on the stage for bhajans. There was a small anecdote. Near the front, Swami threw a vibhuti packet for one of the students as He was passing by in the car. The packet hit the glass and fell into the car. 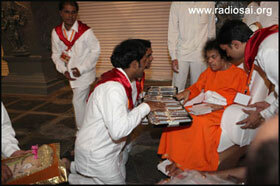 The student got up and when he went near the car, Swami took another vibhuti packet to give him. As he stretched his hand, Swami mischievously threw it in the same manner and with the same result! Then, smiling Swami told the driver to drive on leaving behind a smiling and confused student! 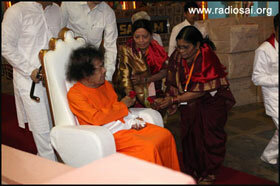 Arriving on the stage, He sat for bhajans for about 10-15 minutes after which He received aarthi. 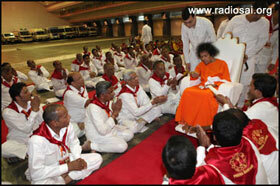 He then blessed prasadam for distribution. Seeing the distribution speeds vary along the gents’ and ladies’ sides, He commented on the ladies’ speed, “They are distributing so slowly!” Once the distribution was done, Swami retired for the day and everyone applauded for the extra minutes that Swami had spent after the aarthi.